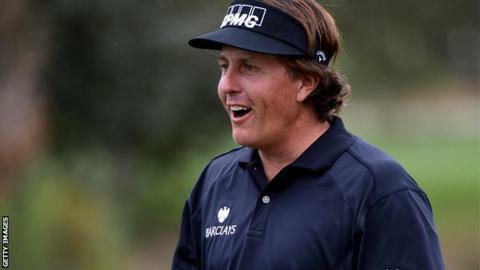 Phil Mickelson shot an 11-under-par 60 in the first round at the Phoenix Open to miss equalling the PGA Tour record by a single shot. The 42-year-old left-hander made seven birdies in his first nine holes, in a career-high haul of 11 overall. He needed a birdie at his 18th to equal the record, but his putt lipped out. Mickelson missed joining an exclusive PGA Tour club on 59, which includes 1966 US PGA winner Al Geiberger and 2001 Open champion David Duval. The American, a three-time Masters champion, birdied the par-three fourth to move to 10 under through 13 holes, and needed three of his final five holes to be under-par to shoot a record-breaking 58. But under the Arizona sun he faded, and could manage to birdie only once more on the seventh. The four-time Major winner, who is tied ninth on the list of PGA Tour titles won with 40, currently leads the Phoenix Open by four from Americans Ryan Palmer and Brandt Snedeker and Padraig Harrington of Ireland.